Oregon ash is a native tree species found in North America along the Pacific coast. It is reported from California, Oregon, Washington and British Columbia (USDA 2010). In British Columbia, its origin status is unclear and it has been considered both native and introduced. It was first reported from Victoria in 1883 by John Mcoun, who considered that population introduced, but later reported by him from Cloverdale (1887, 1893), where he considered it native. (Ceska et al. 1984). In 1983, it was reported from the Port Alberni area, but the origin status of this population was not clear (Ceska et al. 1984). Earlier authors (e.g. Henry 1915) have concluded it was introduced, however, Douglas et al. (1999) included the species in the BC flora as a native species. Hebda (2004) points to the long presence of ash pollen in the fossil records for BC, indicating that its presence in BC is likely native. He says: "...the pollen record reveals that ash has been a native species for nine and half millennia, though it has never been abundant". Read an article by Denis Knopp on historical reference to Oregon ash in the Chilliwack area (scroll down to page 12). Deciduous tree up to 25 m tall; bark rough, grey-brown, with deep cracks at maturity, young twigs and leaves hairy to woolly. Opposite, pinnately compound with 5-7 leaflets, egg-shaped, 12-30 cm long, entire to toothed, dull-green above, paler below, turning yellow in the fall. Inflorescence of small, inconspicuous male and female flowers in crowded panicles on separate trees, appearing with the leaves; petals lacking; staminate flowers yellow, with minute bract-like calyces; pistillate flowers with larger calyces, greenish. Samaras (winged fruits), in clusters, 3-5 cm long, 3-9 mm wide; seeds 1. Swamps and estuaries in the lowland zone; rare on W Vancouver Island; S to CA. Fraxinus pennsylvanica subsp. oregana (Wesmael) G.N. Mill. Fraxinus pennsylvanica subsp. oregona (Nutt.) G.N. Mill. BC Ministry of Environment. 2009. BC Species and Ecosysem Explorer. Available: http://a100.gov.bc.ca/pub/eswp/. Accessed August 2, 2009. Ceska, A., Ceska, O., and van Dieren, W. 1984. Oregon ash in B.C. B.C.Naturalist 22 (4): 17. Douglas, G.W., D.V. Meidinger, and J. Pojar (editors). 1999. 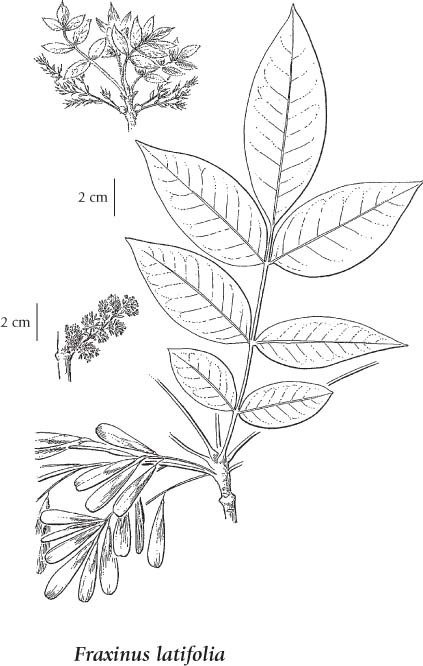 Illustrated Flora of British Columbia. Volume 3: Dicotyledons (Diapensiaceae Through Onagraceae). B.C. Ministry of Environment, Lands & Parks and B.C. Ministry of Forests. Victoria. 423 p.
Hebda, Richard. 2004. The Long History of Oregon White Ash (Fraxinus latifolia Benth.) in British Columbia. Botanical Electronic News #321, January 14, 2004. Available: http://www.ou.edu/cas/botany-micro/ben/ben321.html.